When the prototype Vulcan VX770 first appeared at Farnborough in 1952, it rightly stole the show! A four-engined Delta-winged jet bomber, it represented a massive leap in technology over its famous Lancaster predecessor which had been a war-winning aircraft only seven years earlier – the Vulcan could fly more than twice as fast, more than twice as high and more than twice as far. Considering that it soldiered on in operational service into the 1980s, the fact that it was conceived in 1947 shows how advanced its design was for the time. Specification B35/46 was issued in January of that year, and called for a high-performance, long-range, jet-powered bomber capable of carrying and delivering a nuclear weapon. Roy Chadwick’s early design work was submitted just four months later, though sadly this great British designer never lived to see the Vulcan fly. Once into RAF service the type certainly made its mark, with, for such a large aircraft, performance and manoeuvrability that can still take your breath away to this day. Vulcans formed part of the V-Force, standing on constant readiness as a nuclear deterrent during one of the most tense and dangerous periods in world history following the onset of the Cold War. The fact that it succeeded in its role as a major deterrent at the sharp end, and that the Vulcan wasn’t used for offensive operations until 1982, is something we should all be grateful for. Had it been called into action in the 1950s or 1960s for its intended operational capability of that time, the outcome would have been the self-destruction of much of the human race. When it was used offensively during the Falklands War of 1982 it was on the verge of being phased out. By then, as it was naturally envisaged the mighty V-bomber would no longer ever be needed for such operations, the bomb hoists for the Vulcan’s payload of 21 1000lb HE bombs had been disposed of – so RAF ground crew were reportedly despatched to scrapyards all over Lincolnshire to recover some! Well into its twilight years, the Vulcan then achieved the longest bombing raid ever undertaken; a round trip totalling 7700 miles. At that time there was also a requirement for the Vulcan to briefly fulfil a shortfall in the tanker fleet, before XH558 soldiered on with the Vulcan Display Flight until 1992 as the RAF’s last flying example of its type. After being sold into private ownership and carrying out ‘fast taxi’ runs at Bruntingthorpe for several ensuing years, XH558 made its triumphant return to flight in civilian hands in 2007 – the result of one of the most complex and challenging returns to flight ever undertaken in aviation preservation. 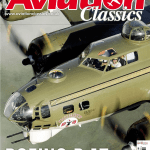 This issue of Aviation Classics looks at many aspects of the Vulcan story, from the roots of Roy Chadwick’s early Avro designs, through the writings of Avro personnel of the early 1950s and the first flight of prototype VX770, on to its military operations including the Falklands, and right up to XH558’s latest financial appeal which went to the wire in October 2010. I hope the selection of articles and photographs we have assembled for this publication prove a fitting tribute to the Vulcan in general, and in particular mark XH558’s 50th anniversary in suitable fashion. How strange things work out sometimes; the first B2 delivered to the RAF became the last to fly in military hands, and now the oldest complete Vulcan in the world is the only example of its breed to remain in airworthy condition. Long may it continue! 8 Vulcan – the Roman god of fire and destruction! 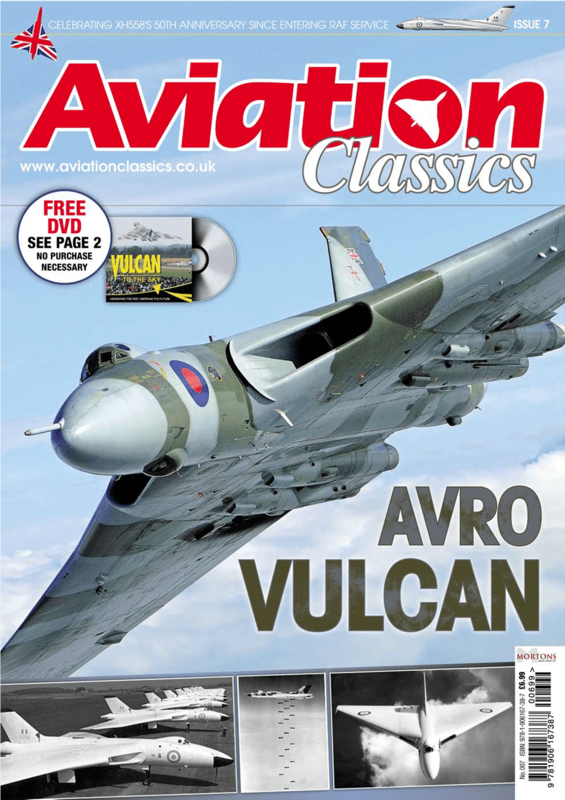 A special preview feature from Aviation Classics – Contemporary background notes on the reasoning behind the design of the Vulcan written by SD Davies of Avro during the type’s development. Many people, and not only those connected with the aircraft industry, are speculating on the reason for AV Roe and Co Limited designing and building the 707 series of Delta research aircraft, the first of which appeared at the 1949 SBAC [Society of British Aerospace Companies] show. After all, the name of Avro is closely associated with the very much larger aircraft, such as the Lancaster, Lincoln and Shackleton in the military field and the Tudor in the civil field. The little 707s seem to be a complete departure from this tradition. The reason is partly explained by the fact that the aircraft are research aeroplanes and are intended to find out more about the flying qualities of this sort of an aeroplane which is known as a Delta, because of the close similarity between the wing plan form and the Greek letter Delta. We, like other large aircraft concerns, cannot afford to stagnate and merely produce the same basic type with miscellaneous detailed alterations and improvements as the years go by. The advent of the jet engine has raised the performance levels of all military aircraft and also long-range commercial aircraft, and with the radical change in power plant must come equally radical changes in the airframe to match it. Considering that a military bomber or commercial transport is essentially an aircraft designed to carry pay loads for relatively long distances, the basic aerodynamic problems are rather similar and just as from a military point of view the highest possible cruising speed is necessary, so in the case of a transport aircraft, it has been proved that high cruising speed can lead to overall economy and the lowest overall cost per passenger/mile. From an economical point of view there is a limit to the cruising speed which as is well known, is set by the so called ‘barrier’ of the speed of sound. Some aircraft have flown faster than the speed of sound, but it is not yet an economical proposition to attempt to cruise for long distances at these speeds. However, the nearest one can get to it the better, and it is this consideration which starts the designer thinking on radical lines. In order to fly economically the aircraft must have the minimum possible drag and in order to keep the drag down at speeds approaching that of the speed of sound it is necessary for technical reasons to sweep the wings back at a very pronounced angle to the fuselage. Also it is necessary to keep the thickness of the wing as low as possible in terms of the chord; that is to say, whatever the wing chord is at any particular point along the span, the thickness should be kept down to a value of 10% of the chord or even less. Furthermore, if you want to fly at a true air speed and go as far as possible with an economical fuel load, it is well known that you must go as high as possible where the air is less dense. Unfortunately, the speed of sound drops with increasing altitude and, therefore, as you design to fly higher, you must not only take the steps mentioned previously but in addition you must keep the angle between the wing and the flight path (known as the angle of incidence) low or else the drag will rise rapidly. In order to keep the angle of incidence low it is necessary to keep the wing loading low, or in other words, for a given gross weight of aircraft the wing area must be larger than we have become accustomed to in the last 15 years. Another factor to be borne in mind, is that on a commercial aircraft or long-range bomber, if you want to fly long distances you utilise wings of high aspect ratio; that is the span is largely relative to the chord; the ratio varying from, say, nine up to 14. This is necessary in order to keep down that part of the drag (known as the induced drag) which is the penalty we pay for the wing lift. Now you can get a broad picture of what the designer of a large load-carrying, long-range aircraft is faced with, if he wants to fly at speeds comparable with the speed of sound. He has at one and the same time to sweep the wings back, make them thinner, increase the area and keep up the span. This poses very great structural problems, and in fact to try to keep a really high aspect ratio and do all the other things simultaneously is economically impossible. One solution is to reduce the aspect ratio, in order to keep the structure weight down, and let the induced drag rise with the hope that so much saving can be made on the rest of the drag that the total will still not be too high. If you combine what is structurally desirable with what is necessary aerodynamically you soon arrive at the solution that the best thing to do is to taper the wings very drastically so that in the limit the plan form becomes triangular in shape. A little thought will show that with such a wing the required sweep back is achieved and a large area can be automatically obtained at the lowest possible structure weight, since the area out at the tip which causes the big bending loads on the wing structure is reduced to a minimum and, therefore, such a wing of large area can be obtained with the minimum possible structural penalty. Furthermore, our aim of keeping the wing at the centre portion nearest the fuselage is quite large in terms of feet and inches. We now find that as an interesting by-product of the theme we have got a relatively large usable volume in the wing that can be used for packing away the engines, undercarriage, fuel, etc, so that the excrescences hitherto so evident on the wing of an otherwise clean aeroplane have completely disappeared. Furthermore, the thickness of the wing at the centre is sufficiently large as to absorb the fuselage almost entirely so that it is reduced virtually to a streamlined projection ahead of the apex of the triangle. Another by-product of this type of wing with its low loading is that no special devices such as slots or flaps are necessary to keep the landing speed down. The wing loading is sufficiently low as to enable quite normal take-off and landings to be done on existing aerodromes. Once we have abolished the need for landing flaps, which produce big changes of trim that have to be balanced out by the tail, the very need for the tail itself becomes questionable. The large wing chord of the Delta type of wing enables us to fit elevators at the trailing edge of the wing and these elevators have sufficient power to enable the aircraft to be flown through all normal manoeuvres. We thus, by a fairly logical process arrive at an aircraft capable of high cruising speeds for long distances with a respectable pay load and consisting of nothing more than a smooth wing, streamline fuselage nose and vertical fin and rudder to look after directional control. If we have done our calculations properly we have now reduced the drag to the absolute minimum possible, and, therefore, have achieved, whether by military or commercial standard, the highest possible cruising efficiently. Technically, therefore, the case for the Delta on paper is proved provided that in fact it flies in a respectable manner and does not suffer from hidden vices which have been overlooked in thinking only of the performance. Any aircraft company interested in the large type of aircraft cannot afford to ignore the possibilities of the Delta configuration. It is one thing, however, to prove a theoretical case on paper and it is another to sell it to the customer. 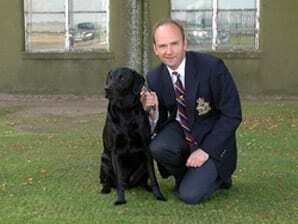 What more obvious step, therefore, to take than to build a small one and fly it and this the Avro Company has done. This, however, is only the beginning of the story; to translate this rather hopeful lesson into a large and intricate piece of hardware such as a bomber or a transport aircraft requires an enormous amount of investigation into the engineering details and it is here where the designer’s art is more important than his science, where time is dictated by the speed with which materials can be obtained, fabricated and assembled equipment provisioned and tested, all of which adds up to a process which can run into many years. 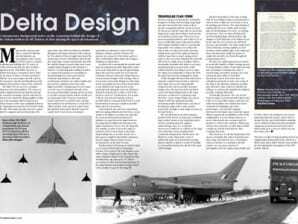 A special preview feature from Aviation Classics – A representative description of an air display routine by XH558. Few aircraft have had such an impact on air shows in recent years. Vulcan to the Sky’s XH558 has certainly been a major attraction since its return to flight in October 2007, and then its subsequent appearances at many events. Its debut display under civilian operation as G-VLCN came at the 2008 RAF Waddington International Air Show. The Vulcan arrived at the Lincolnshire air base during the early evening of Thursday 3 July, then carried out its Display Authorisation in beautiful blue summer skies. After a series of display routines, it successfully gained permission to display at the air show that weekend. Massive crowds were drawn to the event and such were the numbers that the organisers had to close the gates relatively early on the Saturday morning, as even this large base quickly reached capacity as a result of the Vulcan’s appeal – its first public air show appearance for 15 years. XH558’s size and shape make it unmistakable – and its sound as the four Rolls-Royce Olympus engines are set to full throttle certainly leaves no doubt that it has arrived! 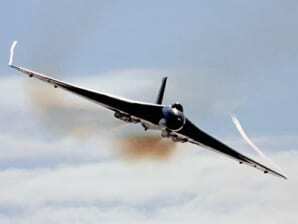 Full power is selected for take-off and XH558 quickly accelerates to its rotation speed of 150 knots. Once off the ground the Vulcan’s power allows it to be quickly put into a steep climb. The aircraft’s pitch is progressively increased, from an initial 35 degrees to around 45 degrees. The angle of pitch is carefully controlled by the pilot to keep the speed at around 160 knots. Soon after getting airborne the brakes are briefly applied to stop the wheels from rotating, then the undercarriage is retracted. The 160 knot speed is maintained until the Vulcan’s pilot levels the aircraft out at 1500ft, having demonstrated the type’s performance. Power is reduced to 75%, then the V-bomber is put into a descent as it heads to a position ready to enter its display and accelerates up to 250 knots. The first flypast is carried out at an entry speed of 250 knots at a minimum height of 300ft, and is referred to as the ‘bombing run’ due to its nature. As the jet flies along the runway, power is increased and XH558 accelerates up to 300 knots by the time it reaches the end of the display line whereupon it will have also climbed to 500ft. Power is then cut to almost to idle and the airbrakes are extended as the Vulcan breaks away from the crowd and climbs to 800ft. Its speed will by then have eased back to 160 knots, power will be re-applied, the airbrakes will be retracted at the 270 degree point and it will drop back down to 500ft as it comes around to return head-on at crowd centre. Once in the correct position the pilot will begin a steep turn back on to the display line and the throttles will be pushed forward to full power. He then puts the Vulcan into a steep climb to 1200ft. At that point he will commence a turn away from the display line and begin a descent with the airbrakes deployed. Power is eased back to 70% and the speed kept at 160 knots, partially using the airbrakes to control it when necessary. The Vulcan again levels out at 500ft, turning to crowd centre once more. It is then turned back on to the display line for a pass with the bomb-doors open by the time the jet reaches crowd centre with its underside facing the audience. Speed must not drop below 150 knots during the full 360 degree turn with 45 degrees of bank which is then carried out, and by the time the Vulcan returns to crowd centre the bomb bay doors will have been closed. This turn is continued until the jet is facing away from the crowd line and then the aircraft carries out a wing-over back towards to the display line, climbing to 700ft during the initial part of the turn. It then descends to 500ft, with the pilot controlling its speed with the application of airbrakes. XH558 then returns along the display line until it reaches crowd centre, where it banks away and makes another turn again with a minimum speed of 150 knots. As it returns to point at crowd centre, power is applied and the V-bomber gains altitude with a steep 60-degree angle of bank in a spiral climb generally through 540 degrees reaching a height of 2500ft – so concluding an impressive display of the mighty Vulcan’s incredible flight capabilities. The Vulcan will then either depart, or if it is to land back at the same venue, the undercarriage will be lowered once the speed has been reduced below 200 knots. It returns in a glide-approach for landing, the downwind leg being flown with power set just below 70%. The approach speed is 160 knots until the Vulcan descends to 600ft with airbrakes deployed to their ‘medium’ setting. The throttles are then eased back slightly and the final approach will be made at 140 knots, with the airbrakes then being fully deployed. After touchdown on a lengthy runway the nose wheels can be held in the air until the Vulcan slows down to about 70 knots. As well as looking impressive and offering the spectators some great photo opportunities, this slows the aircraft down with little use of the brakes, saving a lot of wear and tear. XH558’s aircrew do not routinely use the brake ’chute, which is reserved in case of an emergency only. Those who have seen XH558 display can’t fail to have been impressed. For such a big aircraft the main aspect of its capability which stands out is its impressive and almost fighter-like manoeuvrability. The noise from the four Rolls-Royce Olympus engines also leaves no doubt as to its immense power.